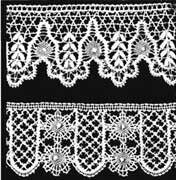 A needle lace made in Argentan France. Production started during the reign of Louis XIV and has many common points with Alencon. The original lace of Belgium is the old Flanders. A variety of bobbin laces made in Hainault Belgium. 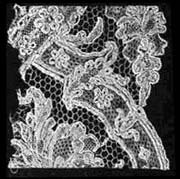 Similar to Valenciennes lace. Bobbin lace, very fine, made in Bruges Belgium. Needle laces, among which can be found, Point de Gaze, Belgium. 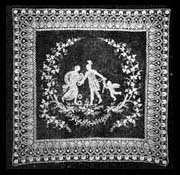 The majority made of black silk, Chantilly lace was greatly esteemed for French fashion in the 19th c.
One of the finest of all French bobbin laces, Valenciennes lace was first made in the town for which it is named. Venice was the European capital for fashion at the end of the middle ages. Honiton is a small town in Devonshire which gave its name to a very fine bobbin lace in which strong floral motifs are joined to a net background. Antwerp, though an old lace-making center, is remarkable for one type of peasant lace, the "potten kant"
Known for their strengh and low price Lille and Arras lace were extremely popular in England prior to the 19th c.
Le Puy en Velay appears to be the most ancient of the French lace centers dating back to the sixteenth c.
Both needle and bobbin laces were made in Ireland before the middle of the eighteenth century but never, apparently, on a commercial scale. 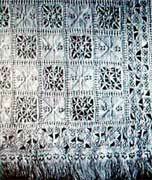 This is a kind of cutwork where squares of woven linen are cut and removed. Milan point was justly celebrated in the seventeenth century. Lace was, however, known and made in Milan at a much earlier date.